I've been to this place a couple of times now and on both occasions I spent the majority of the time in the Garden which I have to say is very nice. Kept reasonably well but be careful if you coming down the steps with a tray of drinks. I didn't experience the bitters & ales there only the lager but this nice tucked away side street pub in Primrose Hill seems a nice enough place to take the friends and family for a Sunday drink, they even allow you to take your dog in which I think more pubs should do, Woof Woof. External colour scheme has changed since photo, for the better imo. Good Timothy Taylor's Landlord was had and I noted another couple of cask/draught. Pleasant interior, still has feel of a pub although they do food too (not sampled). Noted a mega screen in the corner but volume was agreeably low at the time. Could wish for more e.g. wider array of cask but frankly, no complaints. This pub turned out to be better than I expected. The only ales on were GKIPA and Abbot unfortunately, but I nevertheless quite enjoyed my visit. 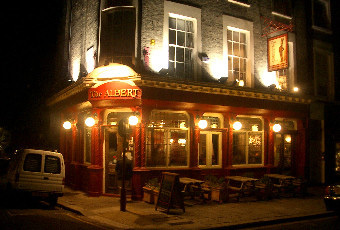 Like other pubs in the immediate vicinity, it has intentionally moved upmarket. It�s bare-boarded, with the usual solid wood tables, but comfortable nonetheless. There was some laid back blues being played during my late lunchtime/early afternoon visit, making a very welcome change from the usual banal pop music. The service was friendly enough. It still retains some of the vestiges of its Victorian, or perhaps Edwardian, heritage. There was what looked like some old etched glasswork in a panel by the door; an iron (?) pillar in front of the bar; some original looking roses round the chandeliers plus decorated cornices. The leaded light windows look the real deal as a well. Like other posters before me, I would say that the food doesn�t appear cheap, but as I didn�t eat there I can�t comment on the quality and therefore can�t say if it is good value or not. I think I�m in the same camp as Planner_21 � I quite like it, but would welcome a better choice of ales. But you either like GK ales or you don�t. For me, in this case it�s the lack of decent ale choice that puts this pub in the �OK� category, rather than the �good� category.